Although the popular serial killer series ended in 2013, collectors and fans of Dexter can still get their fix with 2016 Breygent Dexter Seasons 7 and 8. Covering the last two seasons of the show, each box includes six total hits. Again switching up the box configuration, the base consists of 72 cards devoted to the episodes in Seasons 7 and 8. With 12 episodes per season, that works out for significant base coverage for every episode. Each sealed box includes the full base set. While the autograph checklist has not been finalized, Michael C. Hall has signed for all the previous sets and plenty of notable names have been included over the years. 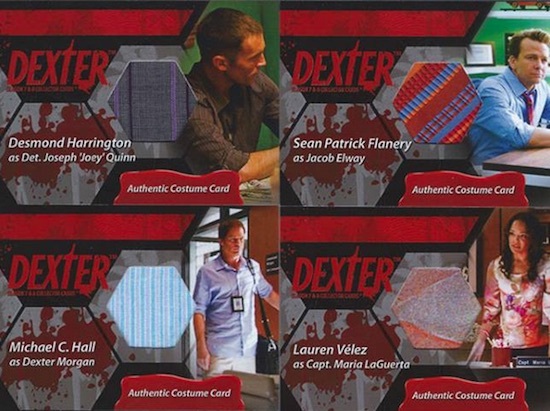 There will also be Authentic Costume Cards that include a swatch of actor-worn memorabilia from the show. Featuring three new chase sets, collectors can find multiple inserts that each average two per box set. 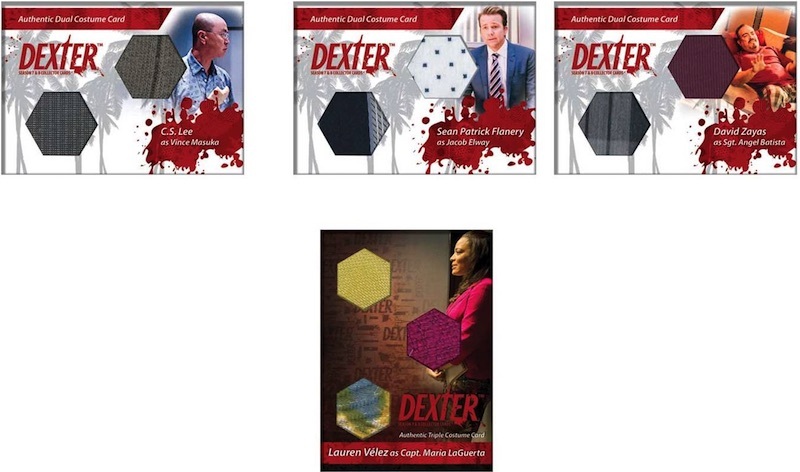 Options include Dexter's Justice, Quotes and Friend or Foe and each set includes nine cards. Case hits include one-of-one foil base parallels and foil chase cards (#/5). Found separately, a variety of promo cards are also available. The full release will be limited to 70 total cases, with ten boxes per case. Issued as a standalone release, there is also a limited 2016 Breygent Dexter Comic Con Seasons 5 to 8 product. Check back as more information for Breygent Dexter Seasons 7 and 8 is revealed. 9 cards. 2 per box.